OpenText™ "WFO Video Series: How can the Contact Center Align with the top Priorities of Executive Leadership?" - Open Text Web Solutions Usergroup e.V. 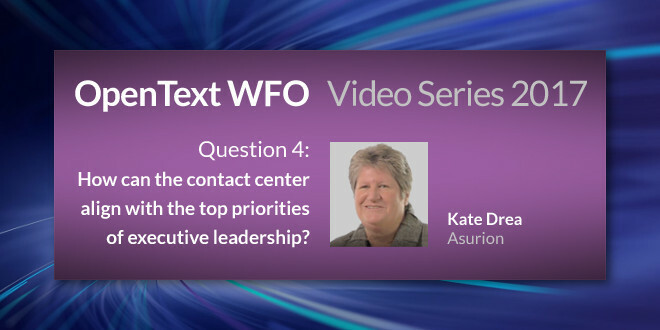 OpenText™ "WFO Video Series: How can the Contact Center Align with the top Priorities of Executive Leadership?" This reality represents an important opportunity for every contact center because customer service agents work in the front lines where customer expectations either fall short, are met, or are exceeded. Recognizing this opportunity and actually seizing it, however, are two very different things. But there’s good news: Our 2017 Video Series – Driving Contact Center Awareness Within Your Organization offers advice from industry analysts and experts about how the contact center can align with the top priorities of executive leadership – in relation not only to customer experience but to other critical KPIs as well.